I was after a grinder for coffee/spices but found the conventional types had quite small grinding bowls (75-100 ml) and low wattage motors (100-300w). The 500ml bowl with 1000w motor blitzes spices within seconds. 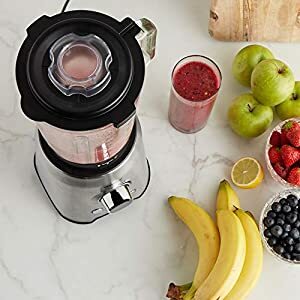 The blender with its glass jug makes smoothies with ease. It’s fairly well built too, considering the price, it compares to equipment twice its value. Bought it to prepare food for my lovely doggy who now needs his food blended to a thick smoothie consistency. The glass jug works really well for wet foods. 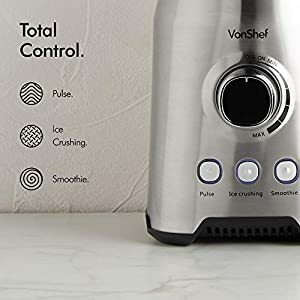 I love the smoothie button which blends automatically for 1 minute to a perfect consistency. The metal grinder is a real bonus for dry foods it is fabulous and grinds the kibbles to a soft powder which can then be easily mixed with water. It is a powerful machine and i would highly recommend it, can’t think there is anything it couldn’t tackle. It looks good to on the counter. I am very impressed by the quality of this product. 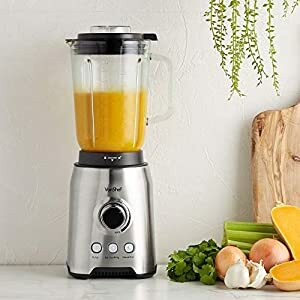 Excellent quality blender, very impressed, powerful and efficient, exactly what i wanted, 5*. Item is sturdy and seems it will last a very very long time. The glass jug is quite heavy, but it adds to its stability and safety. So i don’t mind the extra weight. Dishwasher safe and very easy to use. Very pretty, looks more expensive than it was. 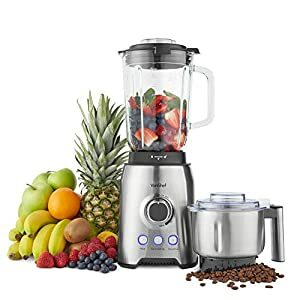 Perfect for my needs, which are smoothies mainly, summer slushes and milkshakes. I wouldn’t hesitate to crush ice in this. And he metal jug for chopping is perfect for smaller quantities. The product delivered to me, is delivered today. Unfortunately much to my surprise it has leaking issues which i got to know while making simple green smoothie for myself. If this machine works a s well as it has so far for it’s lifetime i will be very happy. 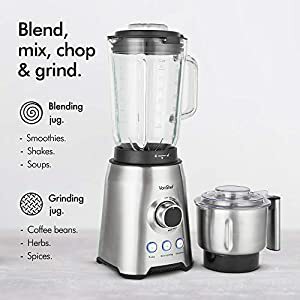 Very pleased, looks nice, blends well, excellent blender, great value, would recommend. Easy to use, good quality and shipped earlier then the day it was supposed to. Frothy smoothies here we come. Very heavy glass jug but good quality. A high quality product. Robust and well made. Absolutely recommend.